Two of the most popular videos on the Learn with Dr Eugene O'Loughlin YouTube Channel are about embedding YouTube videos into PowerPoint 2003 and 2010. My most recent addition today is about doing the same for PowerPoint 2013. The procedure is straight-forward enough - all you have to do is find the embed code for the video you want from YouTube and use the tools in PowerPoint to insert the video. 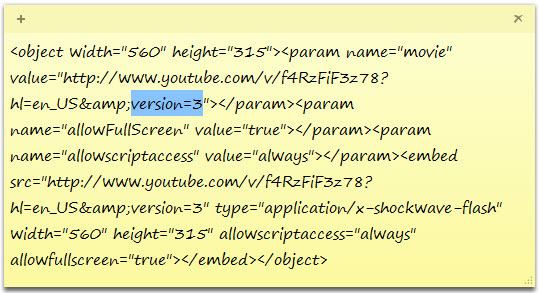 Normally you do not need to do anything to the embed code, but recently, YouTube have added "version=3" for a new Player that causes problems in PowerPoint (no problems embedding anywhere else such as web pages). You now need to delete the references to "version=3" in order for it to work with the current version of PowerPoint. The image below shows the code with "version=3" highlighted - just delete this taking care not to remove any other symbols or characters beside it, and do the same for "version=3" in the third last line below. Some day Microsoft will provide an update to allow this to work, but for now it doesn't unless you take it out.